~Mrs. Mathis' Homeroom~: Pick me! Pick me! I have to admit that I am such a sucker for the Silhouette product line! I have a Cricut machine, but find that I'm not using it as much as I'd like to because it's just such a pain to buy all the different cutting cartridges. Silhouette is the answer to that problem! This machine will cut any font from your own computer! Love it! I want one soooooo bad! What's a girl to do (other than fork out the money for one)? 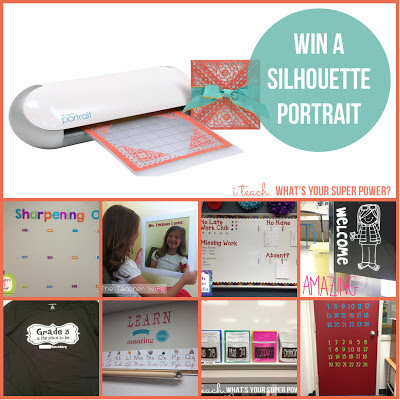 Enter this awesome giveaway by I Teach. What's You Superpower?, that's what! What are you waiting for? Go and enter for yourself too! I hope you win! I have a cameo and it is such an incredible time-saver. Good luck!